Royal Caribbean celebrated a milestone event this month as its next generation ‘smartship’ cruised out of a German ship yard and into the North Sea. The state-of-the-art vessel is an industry first and has generated a huge buzz ahead of its maiden voyage which is scheduled for early November. 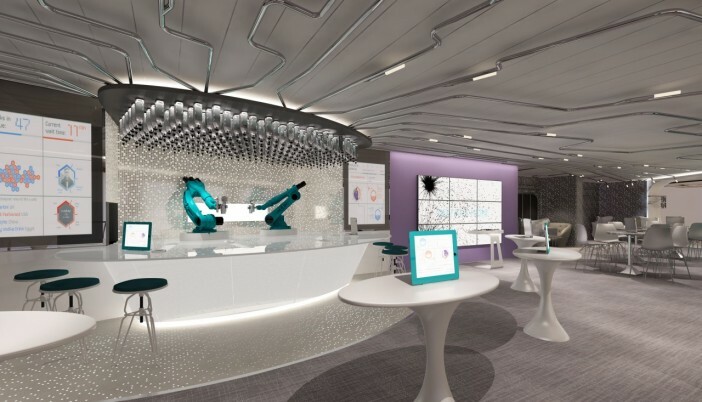 The 4180 passenger ship is a tech lover’s dream and features a plethora of cutting edge features, including bionic bartenders. According to RCI, the futuristic feature combines two of this decade’s hottest trends – mixology and robots! Quantum passengers can place their orders at the suitably named Bionic Bar. For those that love a lighting fast drinks service, the all-new robotic bar staff are just the ticket. According to RCI, they are a world first and offer passengers an unmatched at-sea experience. Rather than spend valuable time queuing up for service, passengers can simply use one of the bar’s in-house tablets to place an order with just a few swipes of their fingertips. Then it’s simply a matter of sitting back, relaxing and watching the bionic bartenders create a refreshing beverage in front of your eyes. From Mojitos to Martinis, the robots can do it all! As for gratuities, cash will still be added to the cost. However, rather than filling the pockets of the robots, it will head straight to a crew wide tips pool. We feel sorry for the poor robots. In addition to futuristic bar service, entertainment venues will also be remarkably up-to-the-minute. On-board Quantum of the Seas will be an ultra-modern dining venue fit out with floor to ceiling windows which transform into larger than life video projection screens. Here, passengers can spend their days watching movies and specially made digital-mapping presentations. RCI has also incorporated the convenience and efficiency of mobile app technology. Specially engineered applications will give passengers the freedom to book on-board restaurants and organise shore excursions in the palm of their hands. On-board the revolutionary smartship, passengers will also find an array of other high tech features including virtual balconies and ship wide Wi-Fi that rivals the speed of on-land networks. “The screens – powered by the same RED Epic cinematic cameras used to shoot House of Cards, Sharknado and more – bring live, real-time views of the ocean and destinations into 375 inside rooms,” revealed RCI. The company describes its latest venture as “the world’s most technologically advanced ship ever to sail.” If you’ve got your heart set on securing a cabin on-board Quantum’s maiden voyage, get in touch with the Royal Caribbean experts at Cruise 1st. The ship will set sail from Southampton on November 2, bound for the glitz and glamour of New York City. For nine glorious nights, passengers will be able to take advantage of all Quantum’s cutting edge features, including the incredible bionic bartenders!